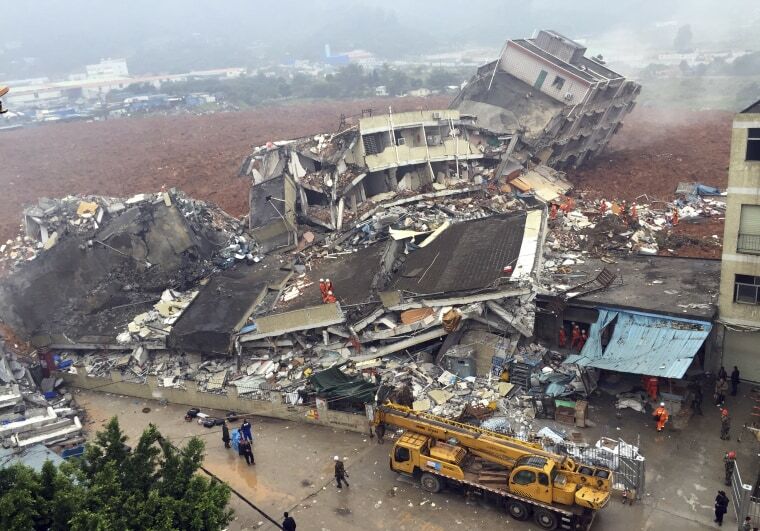 BEIJING — A landslide collapsed and buried buildings at and around an industrial park in the southern Chinese city of Shenzhen on Sunday, leaving 27 people missing, authorities said. At least seven people were rescued after 18 buildings were buried and an area of 24,000 square yards was covered with soil, the Ministry of Public Security's firefighting bureau said in an online statement. Shenzhen's public security bureau posted a notice online saying that eight hours after the landslide, 21 men and six women were unaccounted for. Shenzhen's fire brigade said that one building had collapsed, but that the landslide had affected a large area in the northwestern outskirts of the city. Li Yikang, the deputy secretary general of the Shenzhen city government, said at a televised news conference that more than 900 people had been evacuated. Giving different figures than the fire authorities, Li said that four people had been rescued and 22 factory buildings buried, involving 15 companies. The reason for the discrepancies wasn't immediately clear. Li said that nearly 1,500 people were involved in rescue efforts. State broadcaster China Central Television, or CCTV, said that there was a residential area next to the industrial zone, and that the buildings buried included two workers' dormitories. Ren Jiguang, the deputy chief of Shenzhen's public security bureau, told CCTV that most people had been moved to safety before the landslide hit. The Beijing Youth Daily, citing a local resident, reported that the soil that slid down onto the area had been piled up against a 110-yard-high hill after being dug up in the past two years in construction work. State media carried photos of what looked like at least one five-story building leaning over and partly crumpled in the industrial park, and a sea of brown soil covering a vast area around it.